Alexander Akerbladh settled in Durban at the age of 73 in 1960. He was born in Sundsvall on 25 April 1886 , the son of a Swedish ship owner. Alexander Akerbladh was educated at Uppsala in Sweden . In 1900 he studied architecture at the Glasgow School of Art. He worked as an architect for 5 years before moving to London where he made his living as an illustrator for magazines and newspapers. At the age of 32 he decided to embark on an artistic career and first trained at the St John's Wood School of Art in 1916 and in 1917 in Munich . 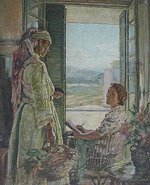 He travelled widely and was a regular exhibitor at the Royal Academy in London and in 1923 he became a medalist for honourable mention at the Societe des Artistes Francais in Paris . 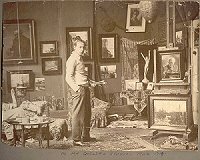 He completed portraits of several leading personalities including the Duchess of Westminster, Sir Julian Amery, Michael Astor and the composer Delius. He travelled and worked in France , Italy , Spain , Morocco , Sweden , Corsica and Majorca . He settled in Durban to live near his only daughter, Maya. In the 1960s he work was regularly exhibited at the annual Natal Society of Artists exhibition in Durban . His work is in public collections in Huddersfield, Auckland and Durban.